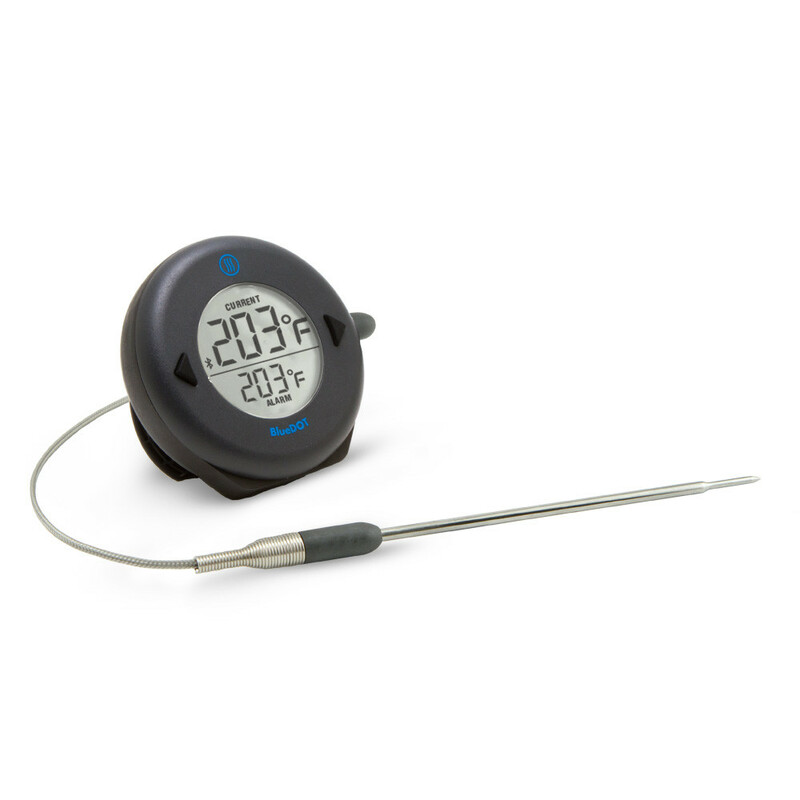 • Both BlueDOT and ThermaQ Blue allow you to track what’s happening with your cook on your mobile device via a Bluetooth connection. • Both ThermaQ Blue and BlueDOT allow you to export data to a file via their apps. • Both feature high and low alarms and continuous Min/Max displays. • Both ThermaQ Blue’s and BlueDOT’s free apps are available for iPhone, and iPad. [Coming soon for Android]. • BlueDOT has 1 probe channel (probe included with purchase). ThermaQ Blue has 2 probe channels (probes purchased separately or in a ThermaQ Blue kit). • BlueDOT uses Pro-Series® Probes with thermistor type sensors. ThermaQ is the most accurate and rugged BBQ thermometer available. It uses Type K thermocouple probes which are known for high accuracy and durability. • There are thousands of Type K probe options available for use with ThermaQ Blue. There are a limited number of Pro-Series probe options available to BlueDOT users. • BlueDOT alarms sound on both hardware and on the mobile device. ThermaQ Blue alarms exclusively on the mobile device via the ThermaQ app. • BlueDOT’s settings (with the exception of the low alarm, which must be set in the app) can be changed on both the hardware and in the app; changes made in the ThermoWorks BBQ app are reflected on BlueDOT’s hardware and changes made on the hardware are reflected in the app. ThermaQ Blue’s communication is one-way; changes can only be made in the app. • ThermaQ Blue is rated IP55, which means it is protected from limited dust ingress and from low pressure water jets from any direction with limited ingress protection. BlueDOT is rated IP65 (excluding probe connector), which means that it is protected from total dust ingress and from low pressure water jets from any direction with limited ingress protection. • ThermaQ Blue will communicate to the mobile device up to 150 feet line-of-sight. BlueDOT’s range is 95 feet line-of-sight. • ThermaQ Blue’s battery lasts approximately 4,000 hours. BlueDOT’s battery lasts approximately 500 hours. • BlueDOT comes with CAL (calibration adjustment) in the app. ThermaQ Blue does not. 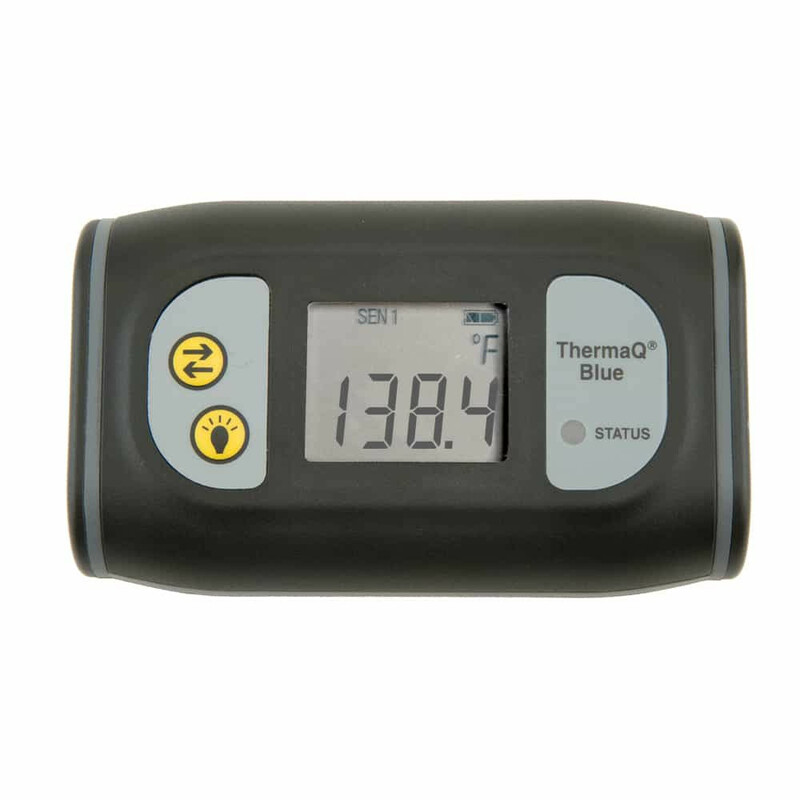 This video demonstrates how ThermaQ Blue allows you to track your cook on your mobile device. This video demonstrates how easy it is to track your cook with BlueDOT.